Miss last month’s Principal coffee with Dr. A? Here’s a little recap the event, where we chatted about the good, the bad, and the incredible here at Cedar Park. Big news! Cedar Park showed the most growth in math (9%) over any other comprehensive middle school in Beaverton in the recent PSAT results. BOOM, baby! Dr. A credits our incredible math staff, as well as Cedar Park’s transition to the accelerated math program for all three years. We are seeing those results! Small backstory here: Cedar Park dropped Math 6 last year. Most incoming students take Math 6/7, Math 7/8, AGS 1, and then AGS 2 as freshman. (AGS stands for Algebra Geometry Statistics.) A small population of students qualify for a higher math in 6th grade and end up taking AGS2 as 8th graders here at Cedar Park. We have an even smaller group taking AGS 3 that are shuttled to the high school. The PSAT is an important assessment-- and means more to students/teachers than the SBAC (Smarter Balance). Our MYP recommendations included providing students with both visual AND performing arts opportunities. So next year’s 6th grade electives will be more of a wheel, where students will get to try a little bit of everything before commiting to an elective (drama, choir, band, art) in 7th and 8th grade. Hmmm… now how is that gonna work with band? Well… band might be its own wheel. The kinks are still being worked out, but incoming students can expect to see changes. Buckle up, CPMS. Beaverton school district is facing some SERIOUS budget woes next year. To the tune of $35 million. Last December, all BSD principals had to return 20% of their operating budget back to the district to make up for this year’s shortfall. For Cedar Park, that was $22,000 no longer in play this school year. The real question-- will the bleeding ever stop? Not until we figure out educational funding at the legislative level. Until then, it’s gonna be a bumpy ride. 8th Grade Historical Fiction Book Clubs. Huge thanks to Cedar Park parent, Lianne Yarvis, for her help in writing these grant proposals. Bravo, lady. So… banning cell phones during school hours actually makes life easier for students and teachers alike. WHO KNEW?! Yes, the new cell phone policy has been a success. Fewer and fewer kids are being “caught” and teachers are thrilled with the school wide, specific methodology of how to handle infractions. Everyone’s on the same page and the kids are actually adjusting just fine. The next PTC meeting on Monday, 3/11 will feature Beaverton High School Principal, Anne Erwin, at 7pm here in the CPMS library. Incoming 5th graders are flying up in March and current 8th graders are forecasting for high school. Our next tentative coffee date will be Tuesday, 4/23. Incoming fifth grade families will be invited so we better put our best face forward (i.e. shower). Like last year, Dr. A will be visiting all of our feeder schools to say hello and answer questions about the incredible world of middle school. Incoming fifth graders will be taking the math placement tests in their elementary schools this year. Advisory has been moved to Thursday mornings. Afternoons just weren’t the best choice & we’ve course corrected. Student socials were a big hit! The last social will be the end of the year parties for each grade level. See you at the next Principal Coffee on Tuesday, 4/23. Hopefully. We’ll let you know if that changes. Buckle up, Cedar Park! Next week marks a significant change in the student cell phone policy here at CPMS. This Off and Away ALL DAY policy begins next Tuesday, 1/29. Students are no longer able to access phones during passing time or lunch. Students are asked to not have their phones with them during the day, but as long as phones are off, away and out of sight, there will be no problems. Students are not allowed to wear earbuds throughout the building; earbuds will need to be kept in their AVID binder so they can access them when needed for chromebook use. What if I need to contact my student during the day? We understand that there are times when you need to send a message to your student. Unfortunately, calling a cell phone or texting your student during class really puts the student in a difficult situation where the adults are asking her/him to choose to follow school rules but ignore a parent, or acknowledge the parent and break school rules that may lead to consequences. If you need to contact your student we ask that you call the front desk - we can either get a note to your student or have the student call you from the front office. What if there is an emergency at school, and I need to know what is going on? This is a common question and fear, but experience in BSD and nationally has taught us that during an emergency, students texting and calling parents often makes the situation worse. Additionally, emergency response groups have advised that in a lockdown situation, a cell phone ringing or lighting up may actually alert an assailant to a student’s location, increasing the danger level. Furthermore, students rarely have the correct information and often cause parents unnecessary panic, not to mention it ties up communication lines that need to be open for emergency and official use. In any emergency, you will receive official, accurate updates from the school, district office, and/or police department. What happens if my child does not follow this expectation and has a phone out during the day? *January 29-February 1:Students will be given a warning if they have their phone out. The entire student body will be reminded 3 times about the change in policy this week via announcements. *February 4th: Students with their phones out in class, the hallway, in the lunchroom, or out on the fields will be sent to the office to turn in their phones for the remainder of the day, if it is their first offense. They may pick up their phone at the end of the day. The student body will be reminded of the policy change 3 times this week via announcements. *February 11: Students will turn their phone in to the office and a parent will be required to pick up the phone, regardless of previous warnings or absence thereof. In addition, Advisory teachers will discuss the new policy and practice with their Advisory class. *Additional violations will result in additional disciplinary consequences. Why are you no longer allowing cell phones to be used at school? We have seen an increase in cell phone misuse in class and throughout the day. CPMS admins and staff also believe that these formative years are important in teaching our future leaders how to communicate and build relationships in the real world. What about before school hours and after school hours (such as during after school clubs)? Phones are expected to be off and away from the time students enter the building until the time they exit the building. This includes before class starts and during after school clubs. Is Cedar Park the only school implementing this change? No. Most of the BSD middle schools already have the same policy. The International Baccalaureate bigwigs are on their way to CPMS this December. Their visit (which has since occurred) is part of the five year reauthorization process that every IB school goes through. Two people from IB central will spend two days meeting with CPMS admins, our MYP coordinator Amy Hattendorf, district reps, and every teacher, as well as check out every classroom. It’s basically an external review team, similar to a high school accreditation process. What are they looking for? Well, they are interested in reviewing our recent self-study and the instructional strategies, and how CPMS is implementing MYP curriculum. This type of self reflection is invaluable for schools. It's clear that we are aligned with the IB philosophy and that we support and encourage participation for all students. It was also expressly noted that our special education students are part of the MYP and valued part of our school community. They specifically commended our special education and inclusion policy. We received several commendations for our collaboration time and dedication to using it for our MYP work. They were very complimentary about the things they saw going on in the classroom; students were engaged and there was clear evidence of inquiry. We use a variety of teaching and learning strategies that incorporate a range of resources and technologies. Our systems for reporting student progress aligns the IB assessment philosophy (which has also made a district wide impact, resulting in our standards-based report card). Official IB Website describing MYP (Middle Years Program). The advisory program at CPMS continues to improve. This year’s change to just once a week proved to be the optimal amount of time and 40 minutes has been better for getting through this year’s defined lesson plans. However, the move to the afternoon has been less than stellar— kids are too antsy! The leadership council is pondering moving it back to the morning for next school year. The goal of advisory? A chance for students to maintain a three-year relationship with a staff member. Even the administrators have an advisory group. It’s also meant to be an academic and social experience. The first advisory of each month is dedicated to creating social connection between the kids. The counselors have also put together a cyber bullying lesson to be shared with students. This month, Cedar Park is running a board game drive in hopes of boosting the options available to advisories. Board games are an awesome way to socialize between students and their advisor. Is there any greater challenge than managing a tween’s phone use? Nope. Now imagine regulating hundreds at a time. Can’t even. January’s staff meeting will include a conversation about phones, Cedar Park’s current “off and away” policy, and the results of December’s parent cell phone survey. Of course, with any change, Dr. A expects there to be quite an adjustment period for all involved-- staff, students, and the wayward parents who text their kids during the school day. (Admit it-- you’ve done it too). The biggest change will be how it affects habits and behavior at lunch. 8th graders will have several options this spring to check out Beaverton or Sunset high schools. Beaverton offers shadow days for rising 9th graders, and Sunset hosts a rather extensive open house. Once the option school window has closed, 8th grade parents can look forward to loads more info regarding open houses, presentations, visits, and forecasting for high school. With Summa transitioning out of Cedar Park, a lot of parents are questioning what that means for their mathematically inclined children not in the Summa program. Other middle schools are in the same boat and are trying out several programs/initiative to boost those students, such as monthly lunch activities, socratic seminars, and extra projects. Here at CPMS, all incoming fifth graders will continue to be given the opportunity to take a math placement test each spring. Our beginning math program (which all sixth graders take) is already accelerated with students taking Math 6-7. Those that qualify will be moved into either Math 7-8, AGS1, or AGS 2. Confused with all the acronyms? Let’s break it down. Math 6-7 and Math 7-8 are part of the CPM program (College Preparatory Math). Parent and student support can be found at https://cpm.org. AGS 1 & 2 (Algebra Geometry Statistics) are high school level programs. Here at Cedar Park, most students will take AGS1 as 8th graders, with the option to retake it freshman year in high school, though Dr. A expects to always have a class of AGS 2 students. Module support can be found here. When in doubt? Google the module and check youtube. SERIOUSLY BRILLIANT. The painters have been busy after school! Cedar Park’s hallways and lockers are slowly getting an update of orange and blue. Thursdays are rep your university days, where kids and staff are encouraged to wear college gear (go Zags!). Tokens will be given out for kids wearing college apparel. This is all a part of the AVID approach-- encouraging college readiness and allowing all our students to imagine themselves on a college campus. The search continues for a long-term PE substitute. The position is hard to fill since it’s only part time and would mean a sub would be giving up a full day’s work (an unpopular choice). However, another teacher is writing lesson plans to gain more consistency into the classroom, er, gym. Spiritwear is happening, America! Socks, T-shirts, sweatshirts, hats… it’s all coming soon to boost our halls and school spirit. The water bottle filter is installed. Cedar Park’s fountains are difficult to upgrade, since the filtered water bottle station requires power. However, most classrooms have a faucet. All BSD schools had their water tested for lead in 2016 and any questionable faucets were upgraded. Hear a rumor? Contact the admins, even if you aren’t positive on all the details. They need to know what rumors are out there to help stop them and protect students. BSD’s IT department is hard at work! By the end of the school year, parents should be able to access their student’s search history-- remotely! Yes, yes, little cherubs. We’ll finally see just what you’ve been up to. And there it is! 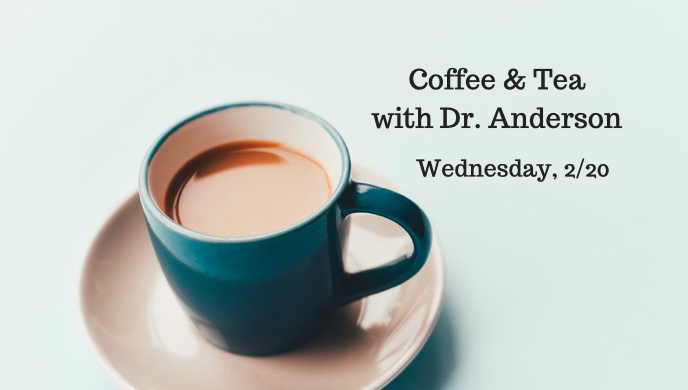 Look for another Coffee & Tea with Dr. Anderson in 2019! Please mark your calendars for the following important dates at Cedar Park through the first semester of 2018-19. More detailed information and additional dates will be sent throughout the year. This informal, drop-in event is geared toward our new families from 5-6:30pm. A sweet treat will be provided as students will have an opportunity to "walk" their schedule, explore Cedar Park and meet other CPMS families. Sixth graders will have the school (and the bus) to themselves as they experience CPMS for the first time. WEB leaders (8th grade mentor/leadership team) will lead them through ice breakers and other fun activities. Students will have a shortened schedule to meet all of their teachers. Students do not need to bring anything except a lunch. CPMS' school day begins at 9:15am. The seventh and eighth graders will join the sixth graders on 8/28. Swing by the school at 5:30pm to preview the health materials for the year. The organized Back To School event begins at 6pm. Parents will hear from administrators, as well as walk their child's schedule to listen to specific class info from individual teachers. NEW THIS YEAR! Join fellow CPMS parents for an informal gathering to broaden our Cedar Park community. We're in this together, so we might as well get to know each other. Our sixth grade is lucky enough to have a fall Outdoor School date, meaning this experience will team-building and an adventure to remember. More info (and paperwork) to come. 6th grade teams are assigned a specific camp. NEW THIS YEAR! Join Dr. Anderson for an informal gathering with other CPMS parents. This is an excellent opportunity to have your questions answered and hear more about policy, strategy, and news at Cedar Park. Morning session at 8:45am. Evening session at 6pm. The PTC's only major fundraiser will take place on Thursday, 10/4 (NEW DATE!). Volunteers will be needed to manage the chaos and ensure a successful event. Our goal is to make our full annual budget so we can sit back, relax, and watch our donations being spent for the rest of the school year. Our fall conferences are invite-only, meaning your child's teacher will contact you if they'd like to meet personally. Conferences run from 5:30-8pm on 10/10 and 8:30am- 8pm on 10/11. NO SCHOOL FRIDAY, 10/12. Our first PTC meeting of the year will feature Safety Resource Officer, Matt Cline, who will discuss online safety for kids and parents. Starts at 7pm in the Cedar Park library. The soccer excitement begins at 4pm. Join our Latino community for a family-friendly event at CPMS, beginning at 7pm. Join other CPMS parents as we staff the Beaverton School District's Clothes Closet from 9:15-4:15pm. Volunteers will sort donations as well as work the store. Look for shift sign-up soon. More info regarding this valuable BSD program can be found here. NEW THIS YEAR! Don't miss out on Dr. Anderson's generous offer to sit down and chat about all things CPMS. Have your questions answered! Morning session at 8:45am. Evening session at 6pm. Additional dates will be added, including Volunteer Orientations and choir/band concerts. Be on the look out for more info as the school year progresses. Looking for the District's 2018-19 calendar? FIND IT HERE. Last September, this Cedar Park community came together to fiscally support the students and staff of CPMS. Our 2017 5K fundraiser (including the accompanying matching funds) raised just over $50,000, a record in recent memory. Our 2017-18 budget also included a Principal Fund listed at $11,500. This line item allows for specific team, teacher, and grade level requests and is overseen by CPMS Principal, Shannon Anderson. Here’s a deeper and more comprehensive look at the impact that fund (and your generous donation) had at CPMS in 2017-18. THANK YOU to every single donor who made this success possible. It is through our combined effort that CPMS continues to make strides and improvements to its programs and events. Our success is indeed POWERED BY YOU. We look forward to seeing you at our 2018 5K, scheduled for Friday, 9/28.